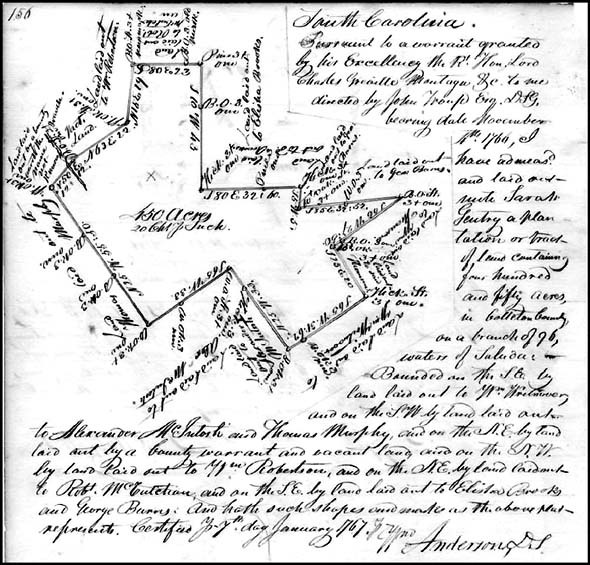 It’s an amazing set of records that The Legal Genealogist picked up at the South Carolina Archives last week. Amazing, first, because it’s a set of surviving land records from the 1760s. Amazing, second, because it’s a set of surviving land records from my family, which didn’t leave nearly as many records as I would have liked. And amazing most of all because it centers on a land grant not to a however-many-great grandfather. To be eligible for that land grant in her own name, Sarah had to have been a feme sole — an unmarried woman — when she obtained that land. And we believe that we was widowed by then, bringing her family of as many as seven sons with her when she moved with her father and brother from Virginia to South Carolina.1 The law at the time would have allowed 100 acres to the head of household plus 50 acres to each additional household member,2 so her grant of 450 acres makes sense (100 acres for Sarah, 50 acres for each son). Pretty cool, huh? The other documents related to the land — the grant itself on 23 February 17684 and the memorial Sarah had to file on 2 May 17685 — aren’t online, and I had to retrieve those in person, but now I have a complete picture of Sarah’s land. Because there’s the minor little issue of exactly where this land was located. I mean, you can see even from the descriptions of these documents — “Plat for 450 Acres in Colleton County,” “Land Grant for 450 Acres in Colleton County,” “Memorial for 450 Acres on Ninety Six Creek, in Colleton County” — that the land was in Colleton County, right? Except that it wasn’t. Not really. Not what people think of today as Colleton County. So don’t go looking for the Gentry land in the much smaller area known as Colleton County today. You won’t find it. It’s way up in the back country, in what became the 96 District, and what I expect today is Edgefield County. “Waters of Saluda” is a very helpful hint. The person’s comment about the “waters of Saluda” might be your key. Saludo County and Edgefield County, as you can see, are right next to each other. Let us readers know what you discover please! Saluda County was not formed until 1895 so would not have been an issue at the point in time Judy is searching. The reference in the grant to the “waters of Saluda” is a specific reference to the Saluda River which passed through several early counties. 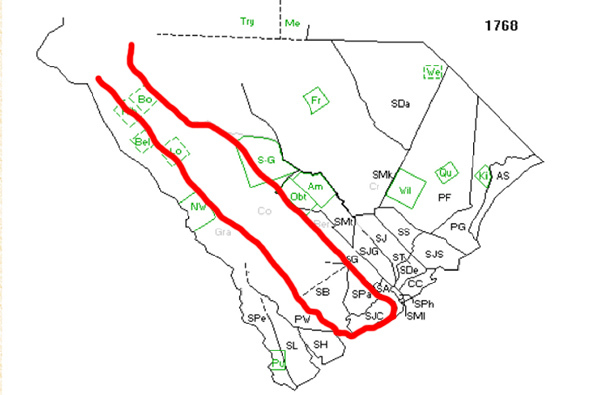 The “96 branch” and the “waters of Saluda” narrow the research focus to two early counties, one of which suffered significant record loss in 1873. Such a great find! I hope you’re able to uncover more documents related to this land, and that you’re able to find out where exactly it was! I think we’re related! I am descended from a Martha Gentry born in SC in about 1780… this woman has been a huge brick wall. I had no idea that there was a Gentry Journal of sorts.